How much have TVs really changed in the last few decades? 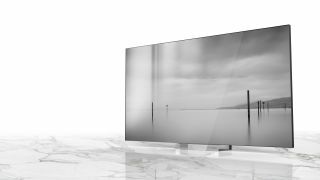 While we’ve seen incredible enhancements in picture quality, pixel density, color gamuts and panel technology over the years, there’s only so much the humble television has been able to change about its shape. Sure, TVs are generally slimmer, wider, and with an average picture quality we could only have dreamed of when flat screen televisions first hit the market. At the end of the day, though, you’re looking at the same old rectangles we had in the 00s and 90s. It’s only now that TV manufacturers have the sophisticated manufacturing to offer something new, and our time at CES 2019, the world’s largest tech expo, has shown us that the air is buzzing with TV revolution. The TVs of tomorrow are increasingly experimenting with new shapes, sizes, and forms. We were struck by the LG Signature Series OLED R, a rollable television that unfurls out of a box at the touch of a button, offering practical use of space and an innovative form factor far beyond the rest of its OLED TV range. Samsung, meanwhile, has been showing off the latest version of its modular MicroLED panel technology. Consisting of millions of tiny LEDs that can be turned on and off individually, in a detachable lattice of screens that can come apart for a personalized size and shape, this tech offers a whole new way of looking at your television and the ways it can fit into your home. There’s a whopping 219-inch model called The Wall, while a comparatively compact 75-inch version – one you might actually be able to fit into your living room – is branded as The Window. As astronomically large as these sets may seem to some, the modular nature of Samsung's panels will give you a lot of leeway as to the actual size of your television. Why not a 40-inch set when half-watching Youtube videos, and an 75-inch set for big sports matches or 4K films? Samsung's new Wall and Window sizes may not have confirmed release dates, but will likely join the existing 146-inch model in the coming year or so – while LG's rollable OLED is set to hit the market in the second half of 2019. These technologies are imminent, and could truly shake up our expectations of what a television should be. Of course, it’s easy to dismiss either rollable or modular televisions as a gimmick. Whether or not your TV rolls, folds, or crumbles into little pieces, you’ll be using it for the same thing, in the same way: staring at a box. And use of these new technologies will, for the near future, likely be restricted to those with a lot of cash to burn. In the next decade, though, as flexible screen technologies get progressively cheaper to manufacture, we could well see folding, rolling, and modular screens trickle down into more mid-range, mainstream televisions – just as we’re seeing with the advent of 4K resolution, smart TV platforms, or even QLED panels. And when we get to that stage, there’s no telling how new screen technologies could change the way we watch and interact with our televisions. In the middle of a Netflix episode? Why not break off a square from your television to take on the tube? Or tug a flat TV screen into a curved gaming monitor when it gets to the late hours? Flexible screens and hardware make for flexible use, and it’s only when these new form factors get widespread that we’ll realise just how much potential they could have. Until then, our regular old rectangle will have to do.